Hey all! This is my first #healthy2018 post, and as the health of my family and myself is very important to me it won't be my last! I'm starting with a staple in my home: fermented milk. 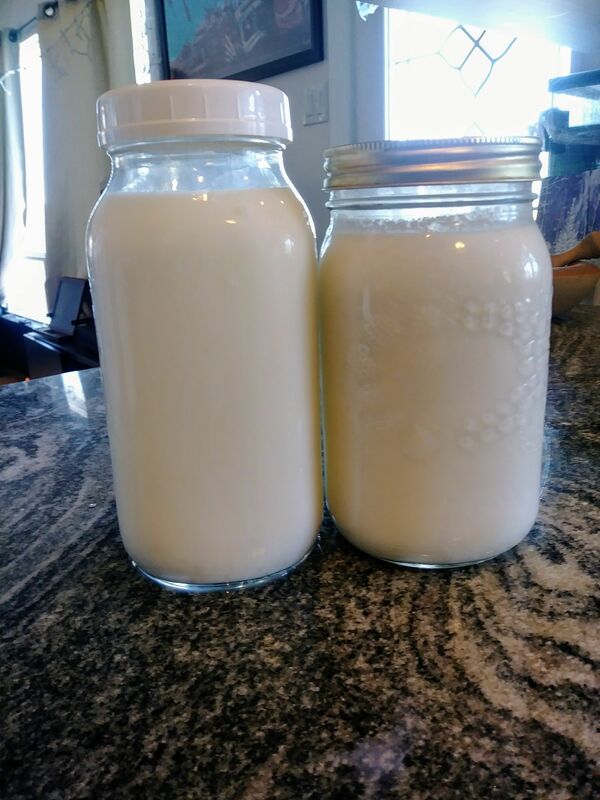 I use kefir grains to transform ordinary animal, seed, or nut milks into probiotic power houses. I used to be really into making kombucha but I couldn't handle all the sugar and it makes my lips itch. Don't get me wrong, it's full of good stuff and delicious to boot, but my loyalty lies with fermented milks. A kefir grain isn't anything like a grain grown in a field such as wheat, rice, or oats. It's only really called a "grain" because of its relatively similar size and shape. Looks more like cauliflower to me! Rather, a kefir grain is a colony of living bacteria and yeasts that cling together in a gelatinous mass of kefiran (and other polysachharides) and feed on the milk you put them in. The process predigests the sugars, vitamins, and minerals and makes them easier for the body to digest and assimilate these nutrients. The milk becomes full of gut friendly probiotics as a byproduct of this action. Probiotic literally means for life. Probiotics do everything from promote bowel regularity to boost the immune system to regulate hormone production in the gut and in the brain to who even knows. Many scientists and researchers have been discovering all the ways in which probiotics influence our bodies. I recently saw an ad online from a local University asking for people with ADD and ADHD to participate in the study in which they gave you probiotics and monitored your improvement. It used to be thought that serotonin (the biochemical that promotes a better mood) was mainly produced in the brain, but now scientists have discovered that up to 90% of the body's serotonin is produced in the gut. If you don't have a healthy gut, you can't be happy. Probiotics are of utmost importance to human health in ways we don't even know yet. Traditional civilizations used to rely on fermentation as a way to preserve the harvest but with the advent of refrigeration we didn't need to utilize these methods and therefore begin to move away from them. It seems to me that people are coming back around to realize that fermenting foods is a great way to save the harvest and nourish our bodies deeply. As I mentioned with the fermented milks, fermented foods like sauerkraut, kimchi, any type of vegetable pickle, renders the nutrients much more bioavailable because the foods are predigested by the lactic acid bacteria. We've all seen probiotic supplements in the grocery stores but the probiotics contained in these supplements are usually a fraction of the amount available in home fermented foods, and don't have the wide range of naturally occurring varieties. These bacteria and yeasts can be found in levels like 50 billion colony forming units per tablespoon! Compare this to a typical probiotic supplement, which contains 5 billion per capsule. Fermented milk is truly a probiotic powerhouse! I could go on all day about the benefits of probiotics. If you want to blow your mind I suggest the books Gut and Psychology Syndrome by Dr. Natasha Cambell-McBride, a neurologist turned nutritionist who healed her vaccine injured son by healing his gut, and Nourishing Traditions by Sally Fallon Morell. To begin fermenting milk with kefir grains you need to acquire the grains first. I was lucky enough to have a neighbor who gave me some as theirs multiplied, which they do regularly if you keep them fed / fermenting you milk. 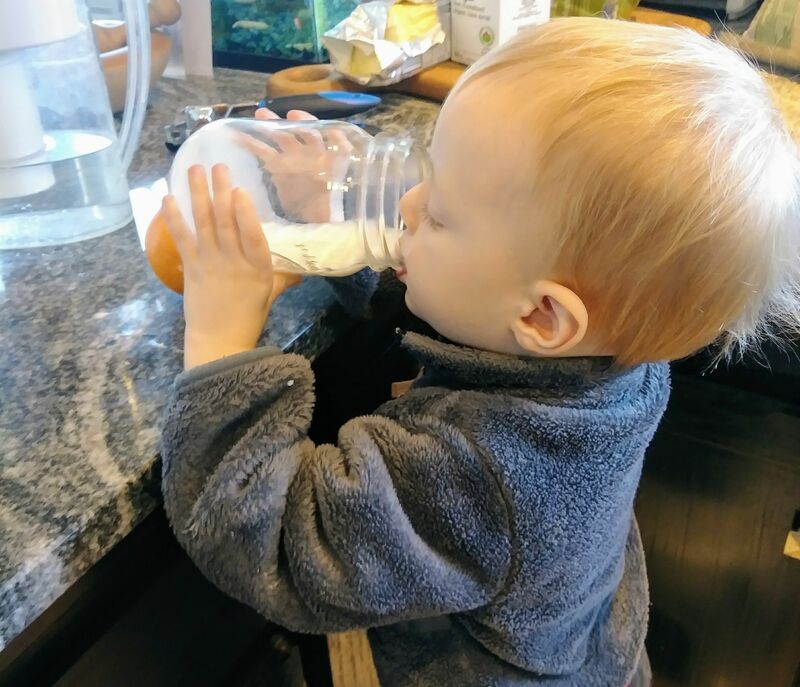 It is believed that Kefir grains originated in the Caucasus Mountains and have been passed down from generation to generation to neighbor to neighbor for thousands of years. You can't make kefir grains in a lab or at home, you have to get them from somewhere. I presently have enough to share with two or more people so if you would like some let me know in the comments and we can work out shipping them to you. 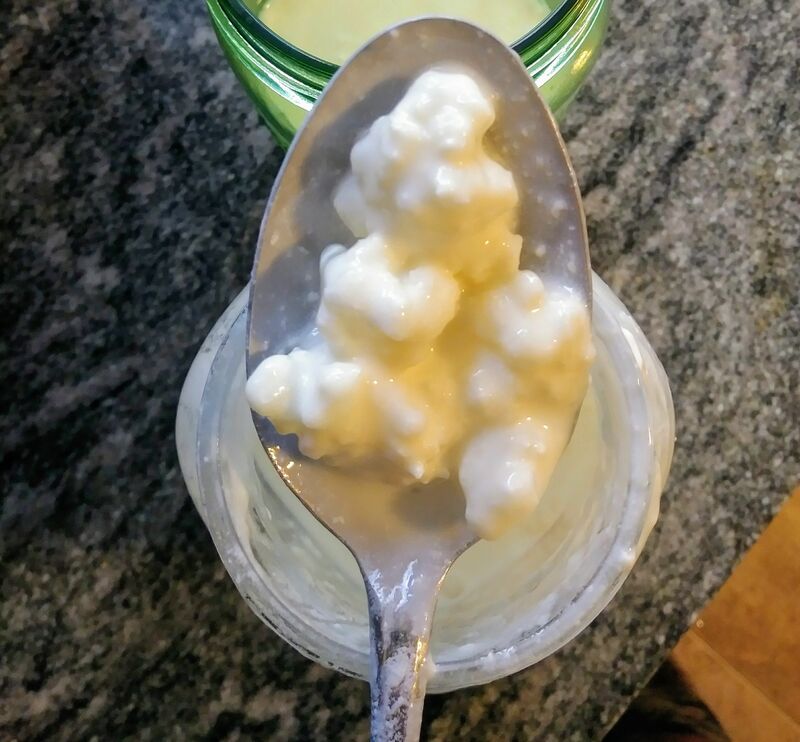 To begin put a tablespoon or two of living kefir grains into a jar with 1 to 4 cups of milk. The type of milk you use is entirely up to you, today I am making fermented cow's milk and fermented coconut milk. If you choose plant based milks your grains might become unhappy after awhile and need to be plunked in some animal milk for a day, but not always. 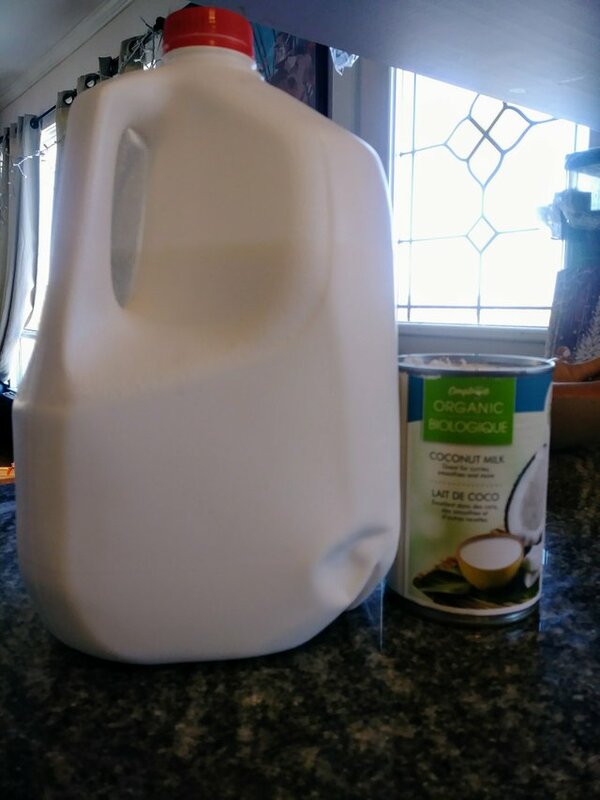 For the fermented coconut milk I'm using a can of full fat coconut milk plus a can of water and 2 tablespoons of grains. For the cow's milk I usually use about a quarter cup of grains to 4 cups of milk. This I make everyday to every couple of days. The more the merrier in my opinion! In my house it gets cold in the winter so unless I put the jar near the woodstove to ferment it takes longer to culture to my liking. In the summer it can be finished in as little as 12 hours! Next, cap and set aside for a day, or longer depending on how tangy and thick you want the milk to turn out. I like mine very sour, but if you go too long it will separate into curds and whey. You can stir this back together, strain the grains out and use, or you can strain it through a cheesecloth and have extra tangy cream cheese. When the milk has fermented to your liking remove the kefir grains by spooning them out, or straining it all through a colander. That's it! Drink the fermented milk as is or try adding some maple syrup and cinnamon, blended berries or a spoonful of jam. I often use mine in a smoothie. Endless possibilities to spruce up this super drink. If you add something sweet, seal the jar and wait a day. The fermented milk will become slightly effervescent! I like adding a little apple juice and letting this happen. Yum! The grains should be put back into milk without being rinsed. If you don't want to make another batch of fermented milk right away, put them in some animal milk and into the fridge. They will hibernate in the cold for months and be ready to go again when you are. Thank you for joining me while I rant about another passion of mine, fermented foods and probiotics! I will be sharing more about how I make water kefir, sauerkraut, kimchi, hot sauce, sourdough starter, ginger bug, fermented grains, pickled carrots and beets, and more! If you found this write up useful, please consider resteeming so I can reach others with this information. If you would like some kefir grains of your own, let me know in the comments! I am keen consumer of kefir - both milk and water varieties. 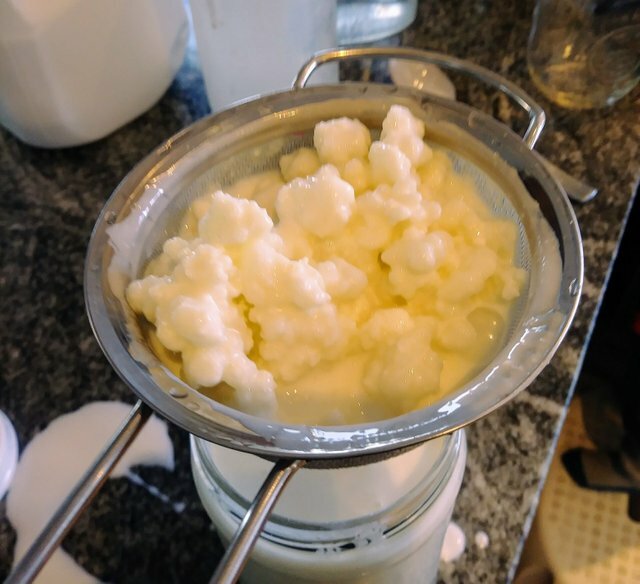 Our milk kefir is growing so much at the moment we can't find enough people to give the extra grains away to. My toddler was munching them while we were making this post, haha. I've read of people dehydrating them and putting them in storage, or feeding them to thier chickens... But yeah, I want to share the goodness! No takers on here yet, I'm surprised, but the post only has 23 views so that may be why. Dehydrating them apparently is tricky to do successfully - although we haven't tried it. We are now giving some of the surplus to the chickens - they love it. Hello @amymya... Really informative article. I have been doing this process for a year now! I started with a sachet with powdered kefir which needed to be reconstituted and so on... I found that lasted for about 2 weeks really well. Yup they grow really nicely, the funny little things! I'm sure your chickens looove the treats. Happy the article was useful to you :) thanks for the comment! REALLY? I just had no Idea. I just buy yogurt as my main source of probiotics. Good to know. AWESOME! I have some kefir grains coming and CAN'T WAIT to try some! I hope it helps you immensely! Kefir definately has the potential to, especially with all the other healthy things you're adding to your life :)!! Ohhhhhhhh how I miss milk kefir!! Think they would make a trip to ontario??? So many benefits to fermenting! I think they would definately make it over to you! Send me your address on discord or steemit chat :) happy you appreciated the blog!! Thank you!! I have to conquer chat soon! Love your blogs! We have so much in common!! Fermenting is the bomb. Such tasty things happen when you add bacteria, haha! This post gets the #healthy-home seal of approval! Fermented foods are awesome! They are great for your family's health! Oh yeah. As I said, whole other level of goodness!!!! !